Picture this: you start off in your small, picturesque hometown in the middle of the sticks, and you buy Armour 1 and equip it before you leave the village. You trek through the Forest Dungeon to Slightly Larger Town, where you purchase Armour 2 and equip it, leaving Armour 1 totally irrelevant. Not long after, you reach Decent Size Town, and you buy Armour 3, and now Armour 1 and Armour 2 are either cluttering up your inventory or have long since been sold for a pittance. To make matters worse, you now have two more party members to feed and clothe, so you need to purchase extra Armour 3s. Shards are items that you equip to access elemental magic (fire, ice, etc. ), while conduits are accessories you equip to boost your Power (magical attack). Armour was mostly for improving defense, but some items also improved other stats. The Other slots consisted of accessories that performed a range of different features, such as improving tolerance to certain stats or boosting one's Water attacks, etc. Rather than buying different Armour (akin to my example in the first paragraph), which is the system I had in the demo, I've changed Armour to work similarly to your weapon, in that you equip parameter-boosting components to it and you upgrade it to higher levels at the armoury. While the weapons upgrade linearly, the armour now transforms depending on the components attached to it. There are a few different paths, depending on whether you favour agility over defense or health over magical defense, for example, and combining different components may result in different transformations. If you don't like the path that you've chosen, you can dismantle your armour for a small fee and recover the components you used. There are three tiers of components (e.g. 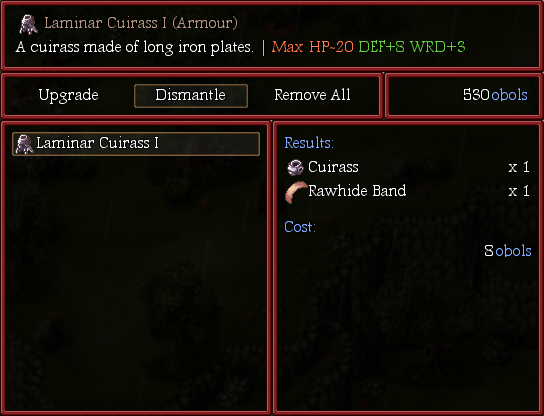 Bronze Plate, Steel Plate and Iron Plate, which are used to forge the Heavy Cuirass), so I can see this being most useful as the game goes on and you want to reforge your armour with the higher tier components. 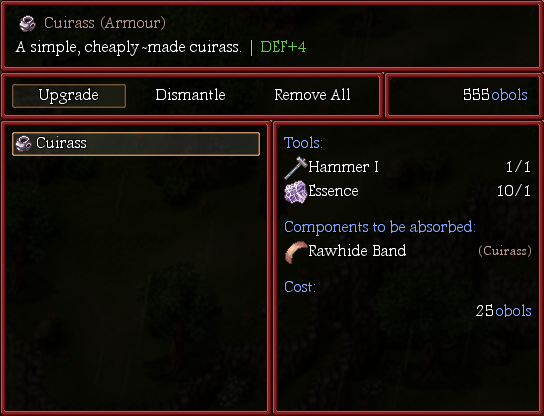 I'm toying with the idea of having a percentage chance of receiving each component (so some might break during the dismantling process), but I'm a bit wary that this may make dismantling armours unattractive to players. I'm still working on a wee window that pops up showing what the armour has transformed into. At the moment, I've got a barebones version working, which simply says "The [armour] became a [new armour]!" The goal is to make a window that shows both armours and their icons and the outlying stats. Just a couple of small changes: you can now swap between weapons by hovering over the weapon and pressing the Shift key, and you cannot upgrade your weapon if it does not have any gems attached. 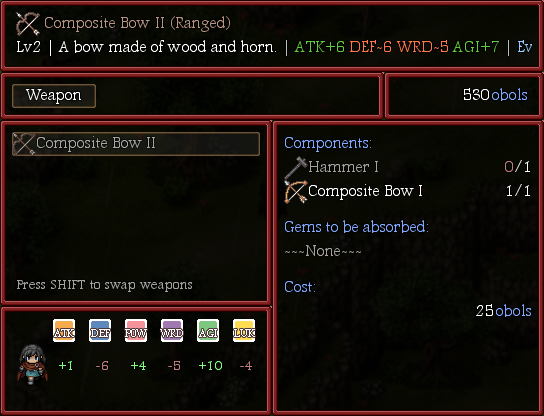 I was getting tired of having to exit out of the upgrade scene every time I wanted to swap the weapons over (since you cannot have nothing equipped), so I think the 'swap weapon' hotkey will be pretty handy for players. I may introduce dismantling for weapons, but I'm not quite sure yet. There are a number of implications I still need to think about. The next systems-related thing that I need to work on is the skill system, which is long overdue for an overhaul. One of the ideas I've been throwing around in the ol' noggin is the concept of elemental skills having levels and their own 'experience points'. Most scripts I've seen level skills based on how often they're used, which is pretty much what I want to do, except I want to base it on how often the element is used, rather than the skill itself. Anywho, that's all for now, folks. I do really need to work on the next lot of maps, but I haven't really had any inspiration to do anything art-related. Once I get this next lot of systems-related scripts done, I'll chip away at it.